We are in Zone 9 (North Texas). 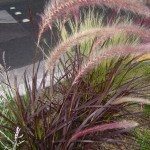 We planted five purple fountain grass last spring and it grew beautifully all summer and fall. They actually grew very large - like almost 5 feet tall. We had a very mild winter - only a handful of days that were in the 30s, no ice or snow, etc. and mainly we were in the 50s. 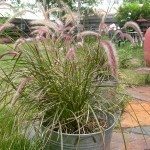 In the early spring, my husband cut the fountain grass back since they all looked bad at that point, thinking they would grow back. Not one of them grew back! We're trying to figure out what we might have done wrong to cause them to not grow back this year. There is a lot of speculation on the actual hardiness of this grass. It appears that some cultivars can handle 20's with no problem, while others will die if it dips into the 30's at all. It could be possible that you had one of the not so hardy varieties. It can be hard to tell after it is already dead. I would make sure that you go for a cold hardy variety. This will ensure that even a mild winter will not harm them.